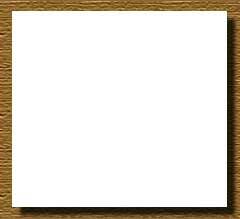 Homepage. This page: Photos dating to the early 20th Century, showing young chaps with vintage Delaunay-Bellevilles. 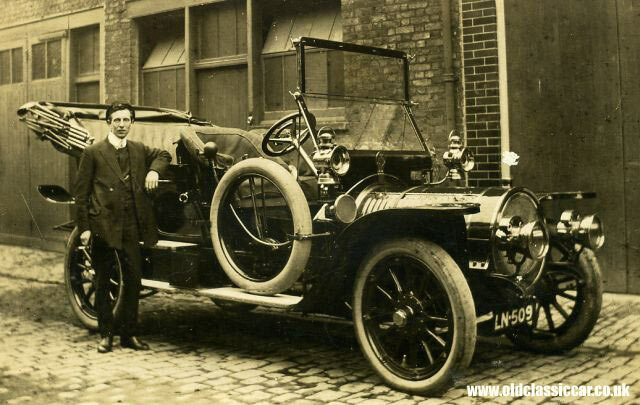 In 2009 Chris emailed this old photo over - it shows his great Uncle, Will Petty, stood with a large Edwardian motor-car. He'd been told that it was a Spyker, but to me it looks much more like a Delaunay-Belleville, the barrel-shaped radiator being the clearest link to this French maker. If anyone can shed any more light on the model of Delaunay-Belleville shown here, by all means get in touch and I'll update this page accordingly. This post-veteran car was registered LN 509, a London series used from November 1906 to March 1908, suggesting that the car shown above was most likely a 1906 or 1907 model. Being an expensive car of the day, Chris thinks that it probably didn't actually belong to his Uncle, and adds: ".. His sister was a lady's maid to a wealthy American socialite, Mrs Ronalds, who lived in Chelsea, so perhaps it belonged to her?". They were indeed a costly motorcar - for example, a 6.6 litre running chassis, minus coachwork, would have cost 740 pounds. The Delaunay-Belleville was built in St. Denis sur Seine, in France. The first car was built in 1903, and exhibited the following year. SA des Automobiles Delaunay Belleville was formed in 1906 to handle production of this new motor-car. Most were powered by a straight six cylinder engine, although some did leave the factory with a four cylinder unit. The four cylinder cars were rated at either 16hp, 24hp or 40hp depending on the model. Over time the sixes ranged from a small 12hp unit, through to a 45hp engine of nearly 8 litres capacity. The early years saw the D-B favoured by the elite, with many Royal owners featuring within the sales records to add further lustre to the marque's reputation as an expensive, and high quality, conveyance. The shape of the radiator was inspired by the company's previous activity of building marine boilers. 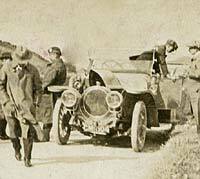 The years prior to WW1 were the company's heyday, with the cars featuring some interesting technical details. All Delaunay-Belleville engines for instance had full-pressure lubrication, and in 1911 the option of compressed air-driven starter motors was offered, with electric starters becoming available in 1914. 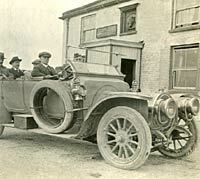 By the late 1920s however the car's reputation, and hence its popularity, had faded, and the firm instead focused its attentions on commercial vehicle manufacture. Post-WW2 the factory was used to produce De Rovin microcars. A Delaunay-Belleville outside the Cat and Fiddle Inn, near Buxton. In 2018 a tattered, 100-year-old, photograph album was found at a collectors' centre. The images within it relate to excursions to different towns in the north/north-west of England, undertaken by a group of gents, possibly workers and managers from an unnamed factory. Amongst them are the following three photographs, taken of a trip taken to Buxton, Derbyshire, in 1916, ie mid-way during the Great War. 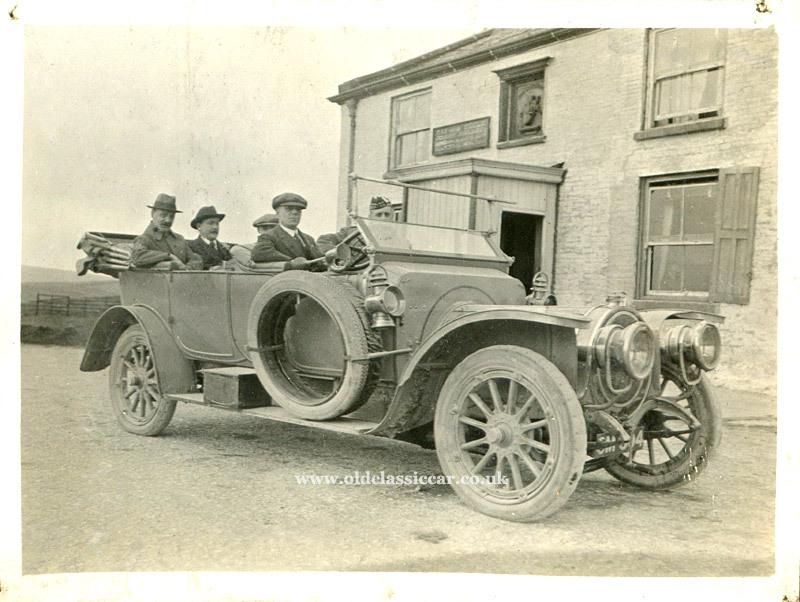 Most of the people undertaking the trip were accommodated within the bulging coachwork of a vintage char-a-banc (photos to follow), while a small number of gents travelled in style with a handsome Delaunay-Belleville touring car. 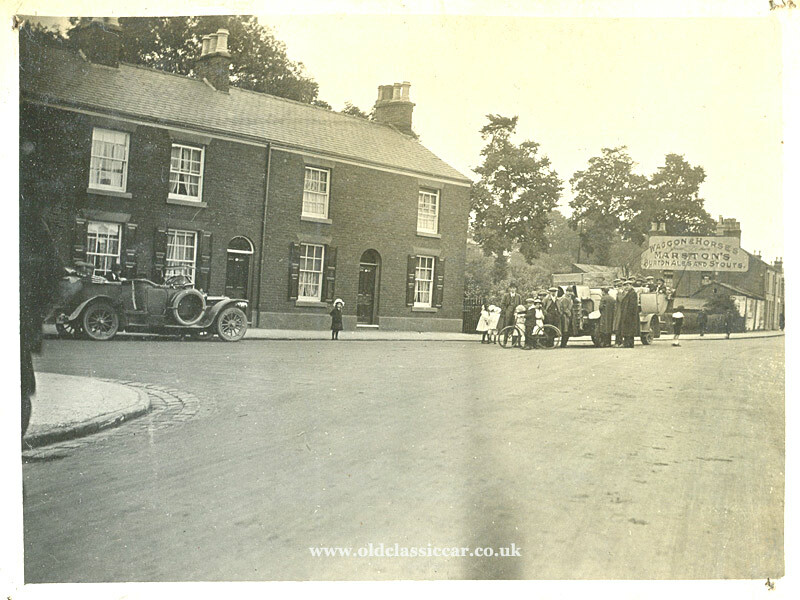 The location for the first photograph is outside the famous Cat and Fiddle Inn, which can be found to this day - albeit currently closed - on the A537 between Macclesfield and Buxton. The pub building has changed here and there over the years, and the Cat-with-Fiddle plaque that can be seen mounted high up on the wall, now graces a new stone-built porch where a wooden structure is shown below. It may be that notes regarding the trip exist on the reverse side of the photographs, however they're securely glued into the album and it would be impossible to remove them without causing damage. Presumably, the party had pulled over for a swift beverage and bite to eat, before completing their trip to Buxton. Photograph number two shows the car once again, parked, this time in a street in Buxton. The char-a-banc is also in view this time, its bonnet raised. Was the driver simply letting its engine cool down, after an arduous and grindingly-slow drive through the Peak District, or was he attending to something more problematic? As the char-a-banc photos will demonstrate, when I add them in shortly, I think it was the latter. 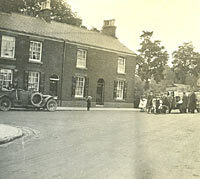 Behind the char-a-banc (its headlamps not fitted) can be seen close to a different pub, the Waggon and Horses. I believe that this photo was also taken in Buxton, but I can find no reference to a pub of that name in the town. Advertisements for Marston's beer, and also Burton Ales and Stouts, adorn its gable end. A child, with bicycle, has managed to get into the shot, as have a number of other children on foot. 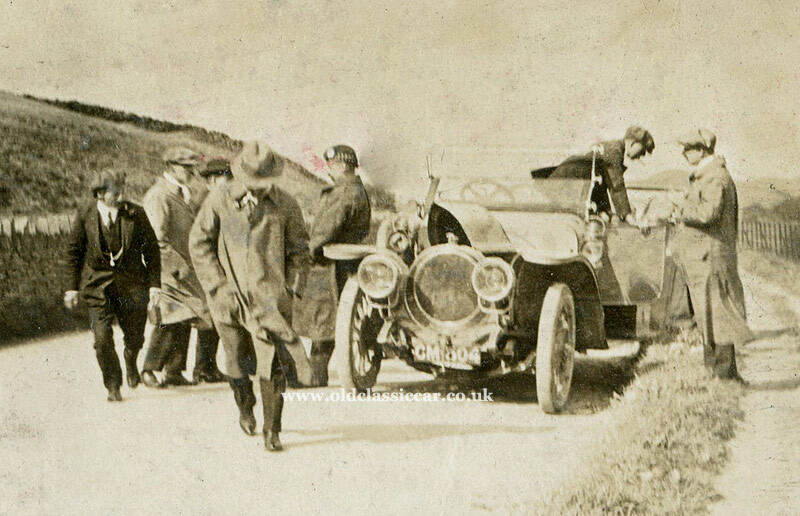 The final photo in this trio sees the same car stopped at the side of the road, its bonnet raised. Had it too encountered issues while traversing the hilly terrain surrounding Buxton? Return to Old Car Photos section, Page No. 10.